External storage is always a great option if you're looking at expanding your phone's internal memory or transferring data from one device to another. It's also usually cheaper than buying a handset with greater onboard capacity, and more convenient as you can keep it when switching phones. 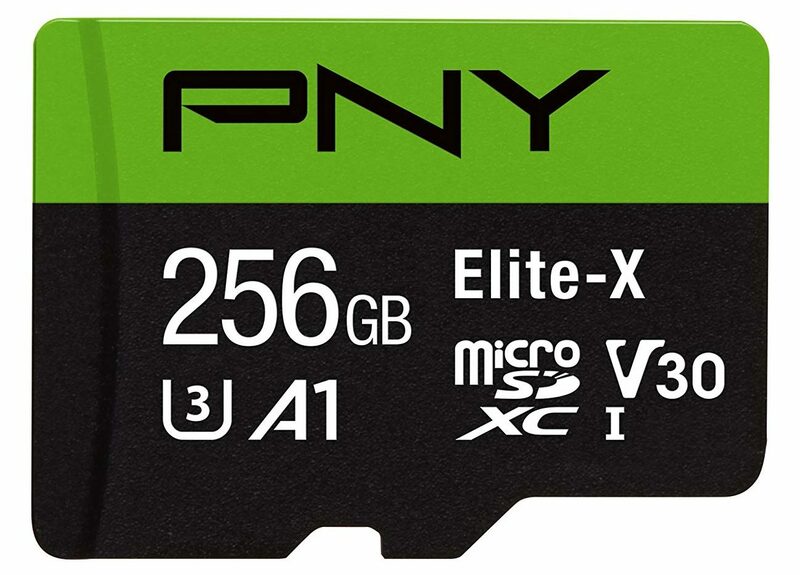 If you're looking at a new microSD card, PNY's well-rated high-speed products just hit an all-time low on Amazon, with some models costing 47% less than their MSRP. Nexus phones tend to last a while, at least in terms of software - thank Google's spot as the gatekeeper of Android for that. 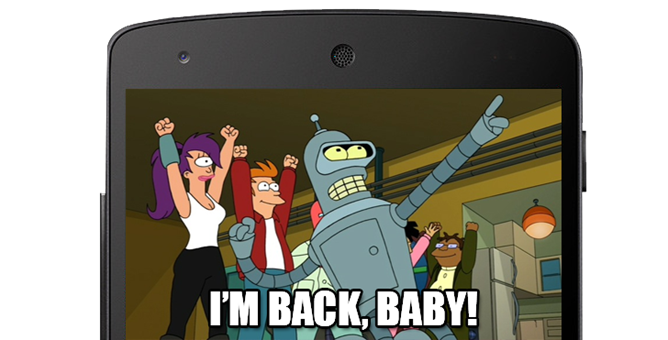 I'm still using my Nexus 6, and will probably continue to do so when the 2016 models come in and it passes the two-year mark. The previous phone, LG's Nexus 5, is coming up on three years old, but it still has access to the latest version of Android with new security releases every month. It's still a great budget phone, especially for enthusiasts and developers. It looks like the $12 stock is sold out. The same drive is now $13.59, which is still a pretty good deal, though Amazon Prime shipping is gone too. If you happen to own an Android phone or tablet that works with USB On-The-Go (OTG) for external storage, you'd probably like some storage gadgets that can take advantage of it. Combo drives - standard USB on one side, MicroUSB on the other - have been on the market for years, but they're not easy to find and they usually carry a premium over more conventional designs. We've been seeing some fantastic prices on last year's Nexus phone leading up to and following the launch of the 2015 devices. This is almost the cheapest yet: $249.99 gets you the Nexus 6, which is still very much a powerful and desirable phone, from Amazon. This is a new device, with the stock 32GB of storage and either the blue or white color option, plus a standard warranty. 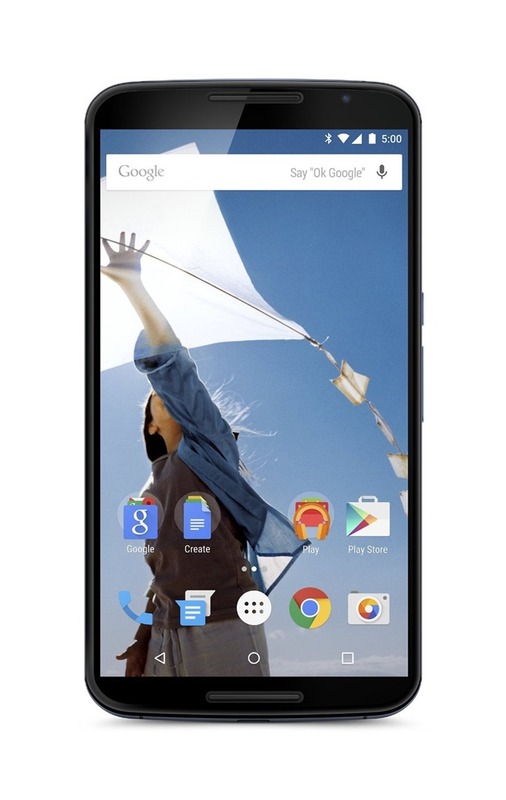 It's a full $400 off of the retail price at which the Nexus 6 launched a little over a year ago. If you need a little more storage, the 64GB model is also available at $299.99, though at the moment it's only being sold in the white version. Deal hunters, get an early start on this one. 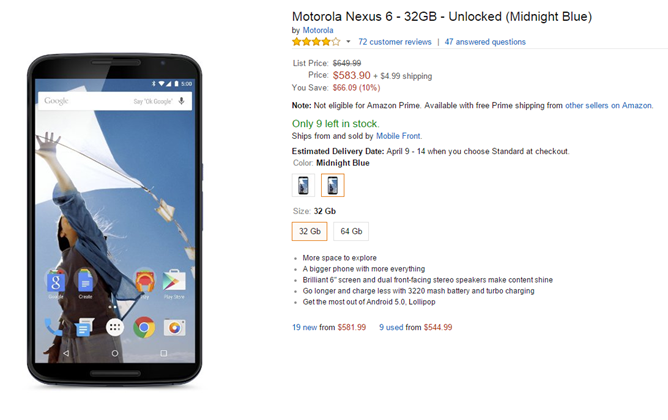 Amazon's US store has slashed the unlocked Nexus 6 price by another $150 (in addition to the $150 price cut a few months ago). That means a full $300 off of both models: the standard 32GB version is now $349.99, and the 64GB version is $399.99. This is a fantastic deal on an unlocked phone, and one that still keeps up with most of the 2015 flagships. Get your order in quickly, because at this price stock is going to disappear very soon. Remember, the US version of the Nexus 6 works with all four major carriers (including Sprint and Verizon), most GSM MVNO carriers, and Google's own Fi. There are some impressive alternatives to Google's flagship tablet, but if you want an AOSP-powered machine with a built-in LTE radio, you're hard pressed to find anything in the same weight class. 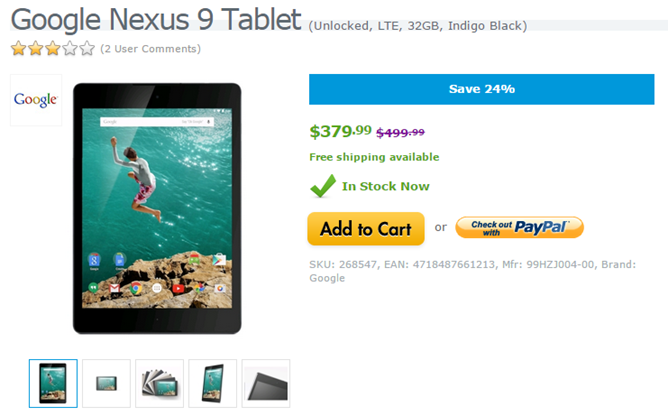 The 32GB version of the Nexus 9 LTE goes for a whopping $600 on Google's online US storefront. Amazon is selling it for quite a bit less, but if you want a good deal, you can't beat Expansys USA. Expansys is currently offering the LTE tablet for $379.99, a full $220 off of the retail price and $70 cheaper than Amazon. In fact, it's actually cheaper than the retail price on the 16GB Wi-Fi base model - that's still going for four hundred bucks at most locations. The Nexus 6 is a fantastic phone, but it doesn't have the appealingly low price that its immediate predecessors did. If you've been waiting for the price to drop a bit below the $650 mark for the base model, now's your chance. 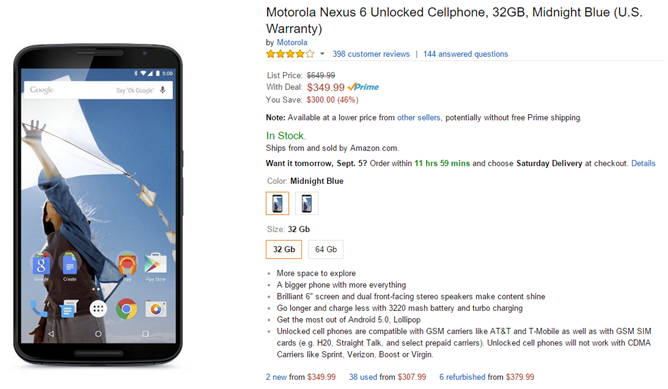 Amazon is selling the unlocked 32GB blue version for just $583.90, a solid 10% discount. The seller is a third party (with no Prime shipping), and at the time of writing there are only 9 left at this price - hurry if you want to grab one. 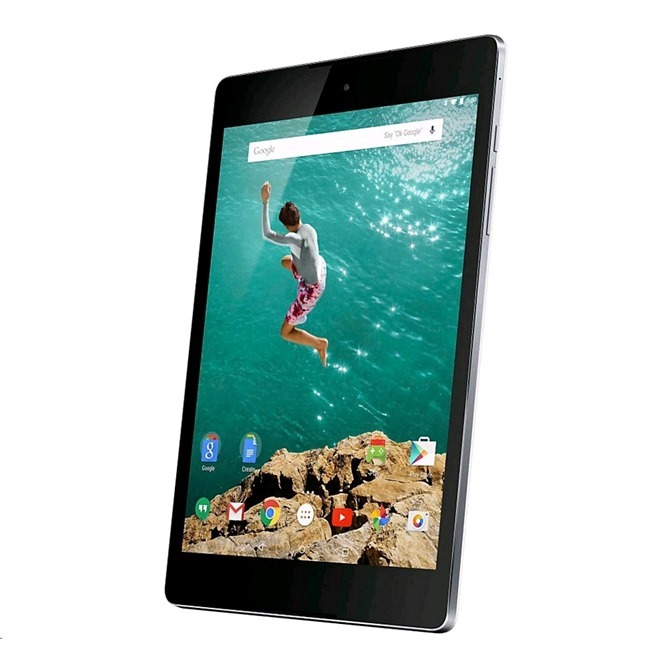 The blue model in 64GB is actually more expensive on Amazon than on the Google Store, but the "Cloud White" version of the N6 has some different deals. 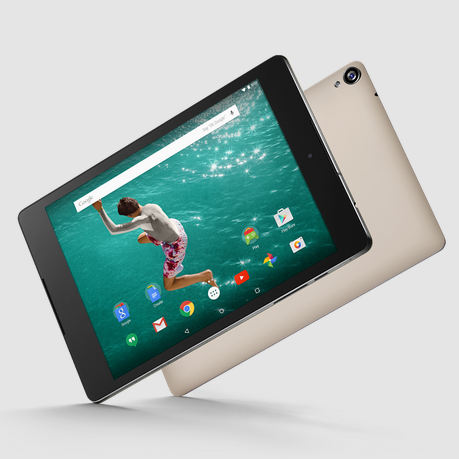 When Google and HTC announced the Nexus 9, they showed it off in the now-standard black, white, and gold "sand" color options. The off-brown color wasn't seen on launch day, though considering the low initial manufacturing runs that Nexus devices seem cursed with, that's not overly surprising. In the small hours of this morning the sand option appeared on the Play Store in the United States - you can pick up a 32GB model now for $479. For some reason the standard 16GB capacity isn't being offered in the sand color right now - you'll have to upgrade if you want it. OK, so perhaps the latest version of the Galaxy Note tablet isn't impressing you, thanks to that overly large 12.2-inch screen. If you'd like a deal on something very similar but a little more manageable, B&H Photo has the 32GB version of the Galaxy Note 10.1 2014 Edition (man, I'm glad they did away with that naming scheme) for $329. That's a whopping $270 off of the price of the 32GB model at launch last year, and still $170 off of Amazon's current price. 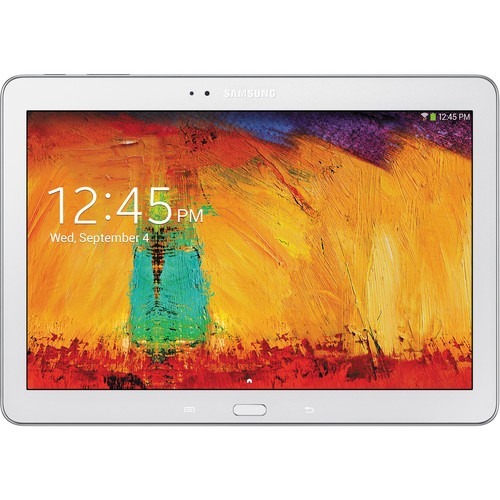 If you need a refresher, the Galaxy Note 10.1 2014 Edition uses an impressive 2560x1600 screen, an Exynos 5420 quad-core processor running at 2.3Ghz, a full 3GB of RAM, an 8MP rear shooter, an 8220mAh battery, and Samsung's standard MicroSD card.